If it is rustic sconces that you are looking for, then you have come to the right place! LodgeCraft has hundreds of cabin, western, Tiffany and rustic sconces. Our American Made sconces come in a variety of finishes and glass options. Our American Made sconces have an American Flag on the detail page to show you the country of origin. 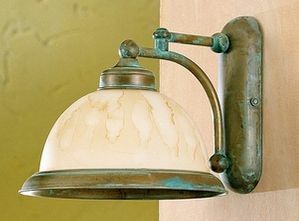 Our imported sconces come as pictured, but rest assured that they are of the highest quality. Many of our rustic sconces are U.L. approved for wet locations outdoors. Most of our rustic sconces are direct wired, however some have the option for a switch to turn them off and on. Whether you fancy bears, cowboys, distressed or any other number of rustic themes, we have the sconce that you are looking for. Many of our American Made sconces cam be customized too, so if you are wanting something other than what is pictured, let us know and we will see if it is doable. Large Wall Sconce - 17"
Small Wall Sconce - 14"
Modern Wall Torch - 25"
Modern Wall Torch - 18.5"